Metallic baby blue FPD Chevy Caprice patrollin' th' Poet's Precinct. Love the dent and jacked up hood. Super high levels of lead in the soil over there. A former GM dump from the 30s and 40s. Ha, Flint at its peak......what other town's police force drove Buick Le Sabres! We also learned to drive at Southwestern' s training course in brand new Le Sabres back in 69 - 70. We had it made.....and, I think, didn't realize it. Buick it is......note the stylized exhaust ports behind the front tire. Get to ride downtown in the back seat of a car like that . . . who says crime doesn't pay? I've got a bedroom in my house with fewer square feet than the back of that Buick. On driving ranges (I learned at Northwestern): Since leaving Flint, I'm always surprised at the number of people who find the whole idea of driving ranges bizarre. Was it just a Michigan thing? Just Flint? 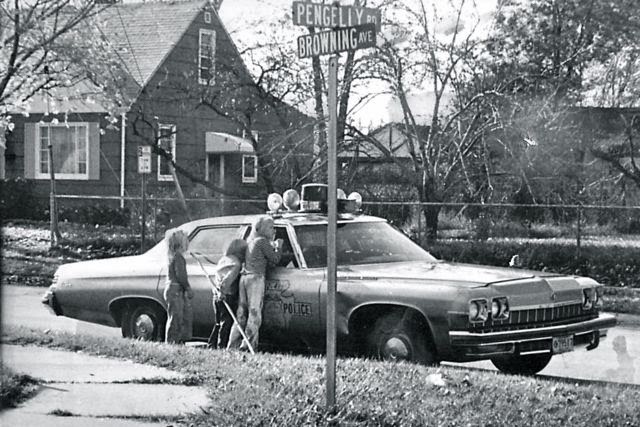 Marie, the photo of the police cruiser on neighborhood patrol was taken in the neighborhood across south Saginaw Street from the then-still-operating GM Fisher Body plant, between Atherton and Hemphill. Back then, Buick bodies were made and painted at Fisher Body, then trucked to Buick City to be assembled to the other parts of the vehicle. There were driver training courses--closed circuits, not connected to the public streets...at Southwestern and Northwestern. The Southwestern one can be seen on Google Earth, in rather decrepit condition, at 42°59'44.83"N, 83°42'12.72"W.
no, there off south Saginaw,across from the old fisher body plant. flint schools, southwestern. Browning is over by Hemphill and Atherton area which is near Ainsworth where I spent a couple of years before they merged with Carman. These are over by Atherton Rd. east of Saginaw St. I believe this is the same neighborhood where former Prosecutor Art Busch grew up. Must have grown up there thinking Flint needed a lot of lawyers, if Benjamin Allyn did also. But you see, there were a lot of smart kids in Flint who grew up to be professionals like this. Come to think of it, Don Brandt, now a Traverse City attorney, grew up near there also.